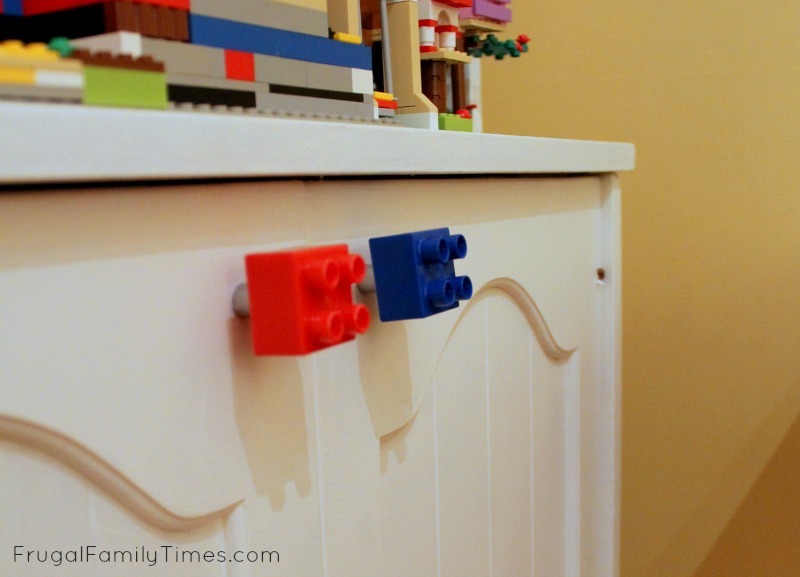 How to Make DIY Lego Cabinet Knobs - So easy! 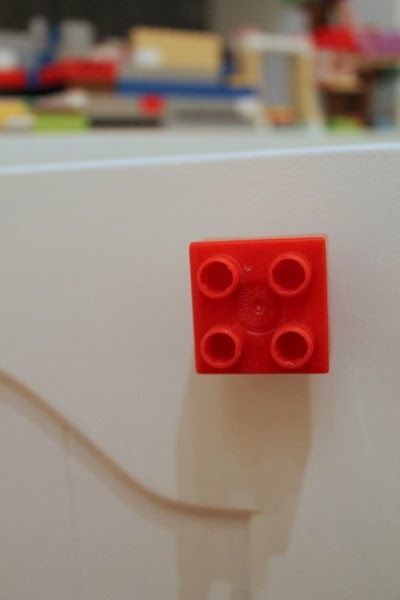 Who hasn't looked at a big Lego Duplo brick and thought: Wouldn't that make a great LEGO cabinet knob? Well, to be honest, we really hadn't either until we were working on our project for re-organizing and updating the kids' playroom. We needed new door pulls, but, well...we were too lazy and cheap to go out and buy them. Robin had a lightbulb moment. 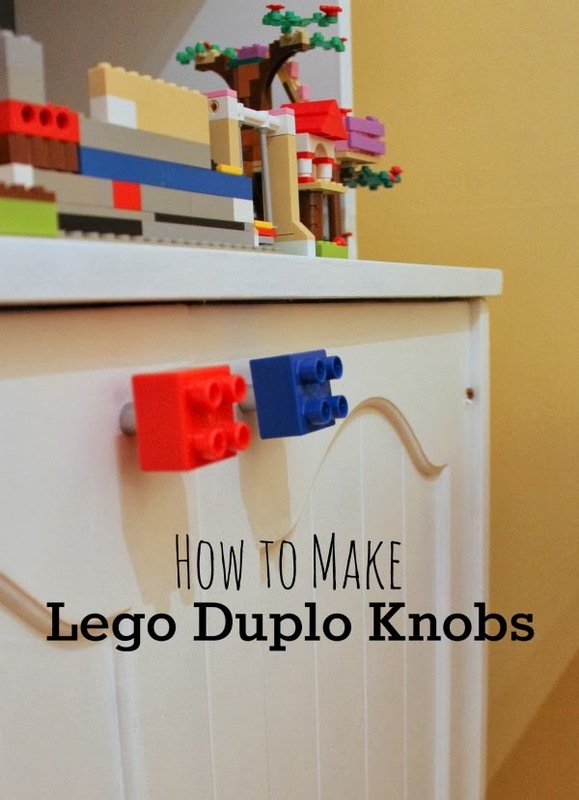 We took some leftover Duplo bricks and added a bit of DIY magic and now we've got fun and colourful Lego door pulls. For two kids with an obsession with Lego - there really is no other appropriate door handle. 1. Measure and cut the dowel to the proper length for handles. I did 1 inch, but you can try it in place and see what works for you before you cut. 2. Sand the ends flat (if you're a sloppy saw guy like me). 3. Pre-drill the holes for doors to screw into. You'll thank yourself later. 4. Try a test fit of the dowel inside the centre post of the blocks. 7/16" will fit, but it will be tight. Don't push it too far in or it'll likely be stuck. Slightly moisten the inside of the blocks, apply glue to dowel and twist in with the hole side facing out (again, you'll thank yourself later). The moisture activates the glue and makes the already tight fit impossibly snug. 4. Paint the wooden handles. Robin painted our handles silver with craft paint. Then we attached them to their new homes. Awesome! Less than 1/2 an hour of total work and less than $3 in supplies for all four LEGO cabinet knobs! We've got lots more Lego ideas, check them out here! This looks great! Huge lego fans in our house too. Lego rules! The kids think these knobs are the coolest - they show all their friends as soon as they walk in the door. Getting kids excited about door pulls - that's a win! Thanks for your comment! I LOVE the idea of using lego on furniture!!! I will use it on my drawers.I like to build with lego (-:0 From Toby age 10.